Our diminutive Smidgen, Pinch, and Dash spoons fit perfectly into narrow spice jars. 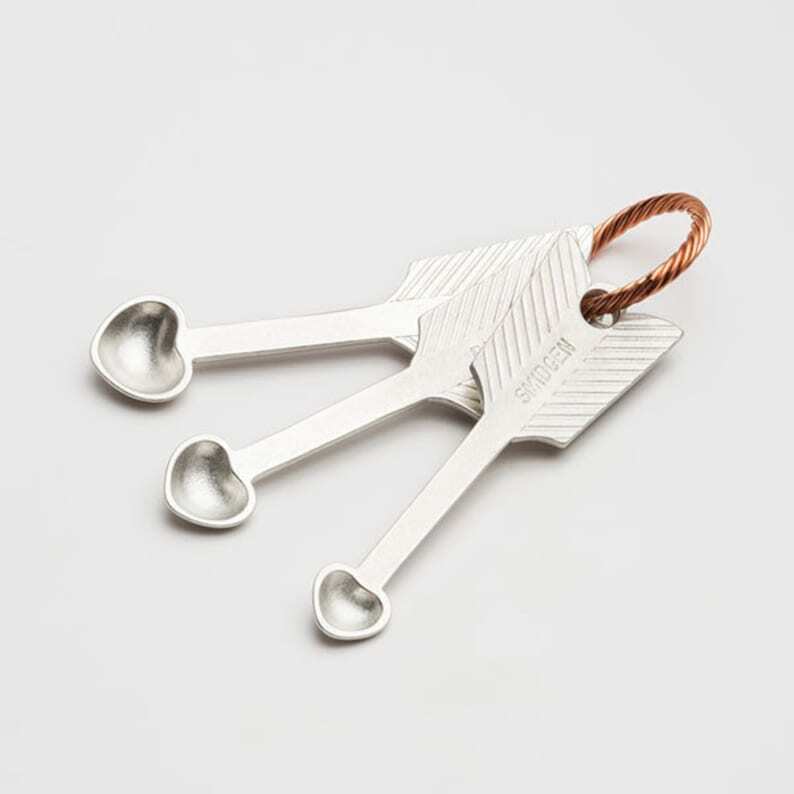 Inspired by vintage kitchenware, we designed these spoons to be sturdy and functional as well as beautiful. They are sure to add some retro style to your kitchen! These spoons are hand cast from lead free pewter in our original mold, then held together with a twisted copper ring. Each set is lovingly nestled in a gift box and includes care instructions. Please hand wash these spoons to keep them looking their best! The longest spoon is approximately 4 inches (10 cm) long. Just like the picture - beautiful and strong! Love this. Matches the coffee spoon I bought ages ago from on shop that’s no longer open. I love this item because it is so good looking and functional too. Absolutely stunning, and it came so quickly! I was thrilled to find this Etsy shop after purchasing a few of your pieces from a shop in San Francisco. Thanks for your beautiful work! We accept Paypal, credit cards (via Paypal and Etsy Payments), personal checks, and money orders. Please note that we will not ship your order until your payment is received. Your state may collect sales tax for online sales. Sales tax (7%) will be automatically added to items shipping to Rhode Island. If you are unsatisfied in any way with your purchase, please let us know so we may remedy the situation and/or issue a refund. $5 Flat Rate USPS Shipping on all domestic orders! Your order will arrive within 7 days. Please, please, double check that the ship to address you enter with your order is correct. International orders ship via USPS First Class or Priority International depending on the weight. We generally ship within 1-2 business days of receiving your order. To prevent delays, please be sure to enter the correct shipping address in Etsy and Paypal when you check out. -- As the buyer, you are responsible for any customs fees or duties that your country may impose in imported items. -- We ship international orders with USPS First Class in order to keep your shipping cost low. However, please note that First Class International is NOT trackable and can take 10-14 business days to arrive, depending on your location and your local post office. If you need your item urgently or would like to be able to track it, please contact us so we can give you a quote for Priority shipping.